Earlier this year, Health o meter announced an entire line of wellness products that the company would launch in the fall. We were able to test the NuYu activity tracker and connected scale when they launched in early September. Now the company has finally launched the $500 Sleep System mat that was supposed to be out in October (well, it's technically only two days late). What makes this connected sleeping pad unique is that it is not designed to track your sleeping patterns, but to ensure that you sleep soundly through the night. 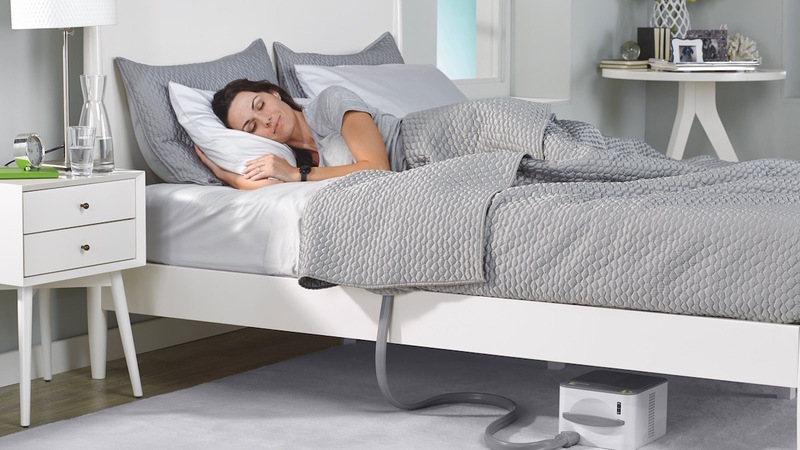 It uses water-based control mechanisms to adjust the temperature of your bed. Unlike a heating blanket, it also cools you down if you are too warm. While water-based temperature control pads are not unheard of, the Sleep System is special because it actually changes temperature throughout your sleep cycle. Using the compatible app on iOS and Android, users set the starting temperature before going to bed. The pad warms you up at night as you start to fall asleep. Then, it cools down while you are in deep sleep. As the morning hits, it warms you up again so you wake up comfortable. The app tracks the user's sleep pattern to provide feedback regarding the best temperature changes to get the best sleep. The concept is genius and it is amazing that it hasn't been thought of before. The Sleep System costs $500 and is available from such retailers as Amazon, Bed Bath, & Beyond, and Hammecher Schlemmer. The NuYu Coaching Plans, which were also due out in October, are still not yet available for sale.